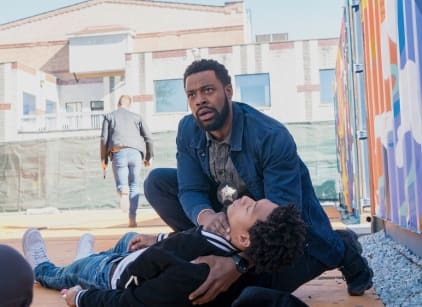 Atwater became the focus of Chicago PD Season 6 Episode 8. Halstead and Upton were undercover trying to bust a street seller named Kenny. When his kid worker was an hour late to the product drop, Upton sensed that something was wrong and her gut proved right when they found Malik shot and killed. His best friend and right-hand man, Nathan, was seen at the scene of the crime and they tracked him down to a woman's house. The woman, Laila, was Kenny's ex-girlfriend and known in the neighborhood for helping kids stay on the right path. Nathan was hiding out at her house when the cops brought both of them in. Since neither of them wanted to talk, Voight suggested they wire Nathan up to get intel from Kenny. Laila said he had a target on his back and agreed to introduce Atwater to Kenny at a birthday party. At the 60th birthday shin-dig, Laila brought "Keith," her new boyfriend but things went sideways when he was caught snooping around Kenny's man-cave. Apparently, Atwater doesn't know to check for cameras. Laila came to his rescue and Kenny let them go, even though they'd raised suspicion. The chemistry between the two was palpable so when Laila suggested they "get a drink," Atwater politely agreed. The next morning, he woke up at her place and promised to "finish what they started" after work. Burgess and Antonio, who was popping pills for his shoulder, staked out to watch the feed from the bug. When Kenny mentioned finding Nathan and bringing him to EP, they crashed the bar to find incriminating evidence linking Kenny to the murder. Despite finding a stash of weapons, nothing led them to Kenny being Malik's murderer. However, Laila's prints were found on a gun used to kill a convenience store clerk roughly ten-years ago. When Atwater returned to Laila's place that evening, it wasn't for the intended fun. Laila got upset that he was bringing up the past; she claims to have been a naive teen back then but she's changed. Unfortunately, Atwater knows that none of that matters in the eyes of the law because it's felony murder. He meets with Voight who tells him that they need to use the prints to charge Kenny and get him off the streets. When Laila is brought in, she goes off about Atwater being a "traitor" to his own people. They wire her up in hopes of getting a confession fro Kenny, but when she arrives at the EP, he's already dead. Since there will be no hearing for Kenny in the decade-old shooting, the judge won't acknowledge Laila's cooperation for a lesser sentence. Laila is arrested and will be put away for three years. Atwater feels guilty and when he confirms that Nathan killed Kenny, he makes a rash decision to bury the evidence and clear Nathan's name. That boy has a target on his back the size of Soldier Field and you want him to wear a wire? Permalink: That boy has a target on his back the size of Soldier Field and you want him to wear a wire? Laila: I'm not wasting calories on that fruity crap. Or a Heineken. Laila: Straight up, you've been around them white boys too long. Permalink: Straight up, you've been around them white boys too long.